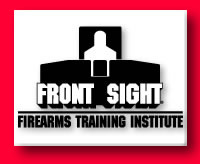 Firearm aficionados anxious to hone their shooting skills while visiting Las Vegas should check out the Front Sight Firearms Training Institute. Front Sight, the vision of founder and director Ignatius Piazza, is a 550-acre planned resort community located 40 miles west of Las Vegas and 10 miles east of Pahrump, surrounded by Bureau of Land Management territory. "At Front Sight we are selling a philosophy," said founder Ignatius Piazza. "This is a getaway for gun owners wanting a vacation..."
Residents and visitors from around the world convene on 13 shooting ranges to participate in one-, two- and four-day weapon craft seminars. Included among the courses Piazzas select group of 95 firearms trainers offer are the use of submachine guns, shooting from a moving vehicle and prep classes for African safaris. Costs vary from the $250 half-day class, offering shotgun, rifle and submachine gun courses, to the handgun master prep course at $1,200. Each Front Sight class maintains a minimum of one instructor for every four students while they are on the firing line. Upon completion, the Front Sight complex will include an airport, a five.story SWAT tower, a 7,200-square-foot armory and a gunsmithing facility, a pro shop, 6,000 square feet of classrooms, nine 360-degree live fire simulators, a defensive driving track, 700 yards of underground storm drainage tunnels for subterranean rescue training, a rappelling wall and a gymnasium. The gated community will be composed of 177 one-acre custom home lots, 350 condominiums, a commercial retail center, community center and a private K-12 school. "At Front Sight we are selling a philosophy,'' said Piazza. "This is a getaway for gun owners wanting a vacation. In much the same way that some folks will purchase a membership at an exclusive golf course, so will gun enthusiasts purchase our membership allowing them to live near our shooting range. Simply substitute gun for golf and you have arrived at Front Sight." Call Front Sight at 800-987-7719 or log on to www. frontsight.com to arrange a class or for information about the residential community.